Napoleon once said, “You can ask me for anything you like, except time.” That has not changed since his time. There is never enough time in the day to get everything you want to done. A busy person is usually running around frantically and will let every person they know acknowledge how busy they are. A productive person is not harried by competing priorities or looming deadlines. They appear calm and in control. Because they are calm and in control, they have learned some things that the busy person has yet to grasp. They have learned to manage their time and make it work for them. Effective people identify what is important and necessary. They separate it from the things that can wait or have no deadline attached. They make a habit of identifying the critical tasks and work to get those things accomplished first. Once they have identified the things that need to be accomplished, they make a plan to get it done and schedule their day or plan their trips accordingly. They use the plan to minimize downtime or to group tasks that need to be accomplished in a certain location. They use the plan to minimize driving time and map out their routes so they can get the most done in one trip rather than making multiple trips because they did not consider other things that could be accomplished at the same time. Because they prioritize the tasks they have and plan how they are to accomplish them, they efficiently use their time. If you identify that you had to get your vehicle inspected that day, then you could also get the oil changed at the same time. The effective person would also have chosen a mechanic close to another location that they needed to go to that day like the grocery store and got their shopping done at the same time the car is being worked on. One of the biggest things effective people do is learn to not take on more than they can handle. They know what is most important to them, have made an efficient plan to get it done and have a very tight time table. If someone else comes up to them and asks them to do something for them, they will have to sacrifice their plan and their time to accommodate that person. Sometimes that is doable and sometimes not. You have to know when to say no in order to efficiently use your time and get your own projects completed. 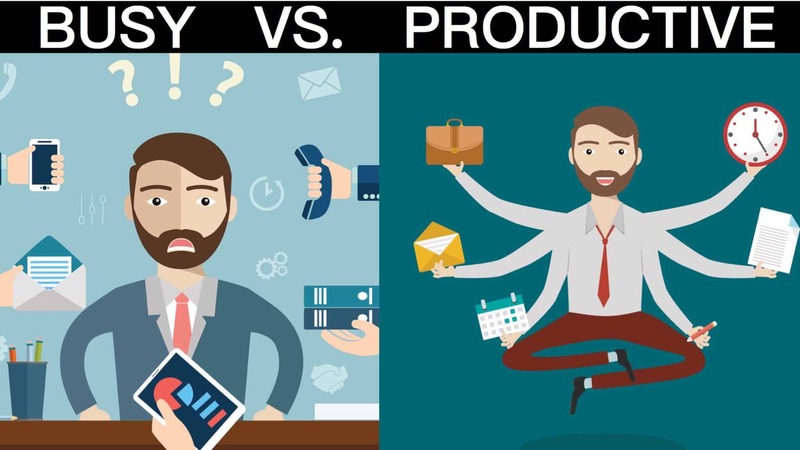 We have talked before about the unseen downsides of multitasking, and how it actually doesn’t help you be more productive. Multitasking is doing many things poorly. Focus on one task at a time so that you can concentrate and give that task your full attention. If you are splitting your focus across multiple projects, you will likely miss something while accomplishing that which you otherwise would not have. If you do it right the first time, you won’t have to dedicate time later to doing it again. Even if it means slowing down a bit and taking longer to accomplish the task, it is generally quicker than needing to do the task more than once because you made a mistake. Learning to close the door is similar to learning to say no. By closing the door, you let everyone know that you are not to be disturbed unless it is an emergency. By shutting out all distractions, you are able to focus and efficiently use your time without being interrupted. Planning, prioritizing, eliminating distractions and focusing on one task are great, but at some point, you have to get things done. It is easy to procrastinate and there are plenty of reasons you can think of when trying to work. The bottom line, though, is that productive, effective people get things done. They don’t screw around or waste time when they need to get things done. They work their plan until they are satisfied with the result. People in groups tend to reinforce the group’s collective will. If you are surrounded by slackers, then you will be encouraged, overtly or subtly, to be a slacker along with everyone else. Effective people surround themselves with other effective people who will reinforce their will to get things done and do them right. Peer pressure can be a bad thing or a positive thing. Effective people want others around them to encourage them and reinforce the attributes they want to embody. Sometimes, it is not about getting the most things done in the shortest amount of time, but about having the maximum impact. Your kids’ sporting events, recitals or plays are very important to them, and while you could sit in your seat and catch up on your emails, plan your day tomorrow or step outside and take a work-related call, you would be spending your time poorly. Spend your time on the important things and not just on the things that make you money. Taking that yoga class twice a week might seem like a waste of valuable time, but it could pay off down the road in health benefits and reduction in stress. Make time for things that have an impact on your life and not just cramming in the most tasks you could possibly do that day. Productive people adapt to their surroundings and to the changes in their lives over time. They are very good at identifying what actions are no longer appropriate or have lost their efficacy and implementing new habits. They may take up new hobbies or learn new skills. They do not root themselves into their habits and watch the world pass them by, but instead, they keep moving forward. To quote a famous science fiction author, Robert Heinlein, “Specialization is for insects.” Human beings need to be able to adapt to new situations and circumstances. It is our greatest strength as a species.